"This gooey cinnamon pull apart recipe will impress everyone in your family! It is an easy (and I mean EASY), fast, and tasty modification of my boyfriend's grandmother's monkey brain recipe. I use 6 small Bundt pans instead of one big one so the cinnamon balls are more gooey :)Fun to make and even more fun to eat!" 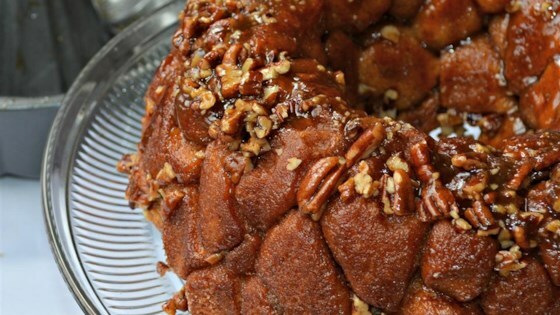 It’s so easy to make fun, delicious monkey bread. The topping is fabulous! Since I didn't have refrigerated biscuit dough, I used frozen diller roll dough, and it turned out great.